Hi, I’m Erin. Thanks for visiting my site, Pink Robin Studio. I started this blog to share thoughts on all things sewing, quilting, embroidery and fashion design. From quilt shop reviews to Project Runway musings, from my newest quilt projects to to new Etsy listings, if it is related to sewing it is fair game on this blog. I also use the site to provide information on the services I offer through Pink Robin including commission quilts, longarm quilting, custom embroidery, and pattern design. You can find current items for sale Etsy or at art and craft fairs in Bergen County, NJ and thought the tri-state area. Or reach out to me here if you need something custom. Why Pink Robin Studio? Pink because it is my favorite color. Robin because this really is a family effort. Rob for my husband and the “in” from Erin and you get Robin. And Studio because I am into so many elements of a sewing life that no other word was flexible enough to cover it all. I started quilting when my daughter was a baby and haven’t stopped. I always sewed home decor items, but when Maddie was three weeks old a quilt caught her eye while we were visiting someone. Since I couldn’t take the quilt off the wall, I went to a fabric shop, bought a book, bought some fabric, and made a simple wall hanging the very next day. I don’t think I’ve stopped stitching since then. I really honed my skill and started making clothes too when I had a neighbor who was an exceptional seamstress – I taught her to quilt and she taught me to tailor clothing. Then I made some really great quilting friends, (mostly Jen, how makes frequent appearances here) who really taught me that a quilting life is about a lot more than sewing. For years I focused my effort on sewing for family and friends. However, I started producing more and experimenting a lot. At that time, my nieces were visiting and I had made them cute tote bags for the trip. We traveled to visit my mom and stepdad in Florida and people kept asking where I got them. At that point I decided to start the Etsy shop, and this blog shortly thereafter, if for nothing else to fund my obsession. 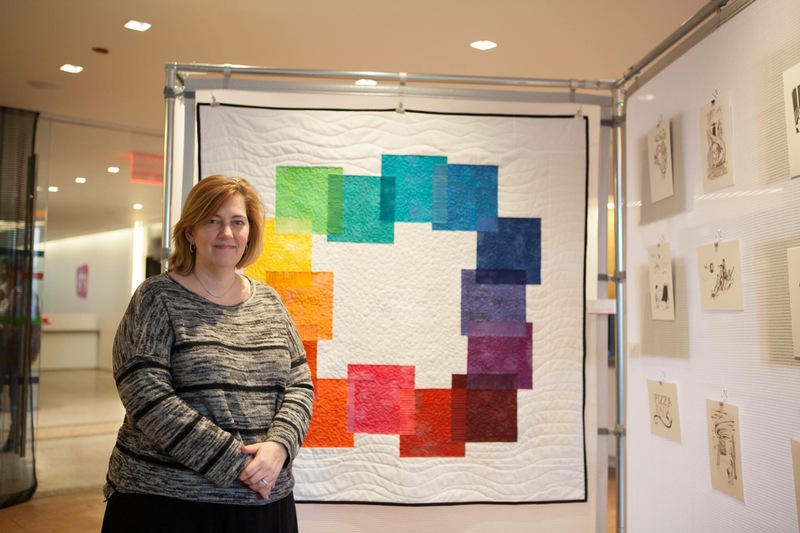 It has grown from there and is amazingly rewarding as I love meeting other quilters and customers at craft shows, quilt exhibits, and the shops I visit. And now I have the pleasure of working in advertising by day and in quilting by night. Please drop me a note at erin at pinkrobinstudio dot com if you would like to chat, place an order, have your quilt quilted, or want to come rent time on my machine and do it yourself. Heck, if you love to sew, let’s just have coffee! Hi Zev – thanks for writing. Ella’s quilt is all ready. You were to email me the address you would like it shipped to. I am at erinholmqvist@gmail.com. If you send me the recipients address it will go out tomorrow. Thanks! PS – are you related to dan and Stacy lazar by any chance? I am interested in getting information from you about a t-shirt quilt. I tried to email you from a business card I have but it told me your email was not found! I am leaving my name and email below! Hi Josie! Thanks for writing. If you email me at erinholmqvist at gmail dot com with your phone number I can call you later today. Thanks again!